Almost 5,000 people turned out on Bank Holiday Monday this week to protest against Theresa May’s plans to bring back fox hunting. This was the biggest demonstration of the election period. The Prime Minister recently promised that if the Conservatives win the UK election on 8th June, she would hold a vote in parliament on repealing The Hunting Act. This law, which was brought in by a previous Labour government, bans hunting mammals with hounds. Foxes, mink, hares and other mammals are protected from being hunted down by dogs by this law. Over 80% of the British public support the hunting ban, yet Theresa May would rather support a bloodthirsty ‘sport’. Care2 supporters led the march alongside TV presenter Anneka Svenska and writer Dominic Dyer. 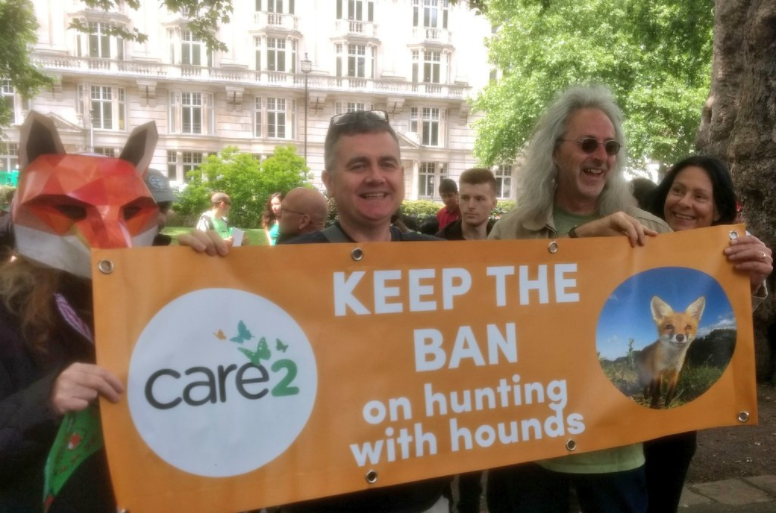 Wildlife TV presenter Bill Oddie and actor Peter Egan spoke at the rally in support of the ban, as well as representatives from hunt saboteur groups. Due to the ‘gagging law’ introduced under the Conservatives, charities and non-profit organisations were unable to publicly support the march, in fear of being reprimanded for taking a political position during the election period. Effectively censorship, the gagging law is a threat to democracy. Despite this, over 50,000 Care2 members in the UK have emailed their candidates in the election to find out how they would vote if there was a vote on repealing the hunting ban. 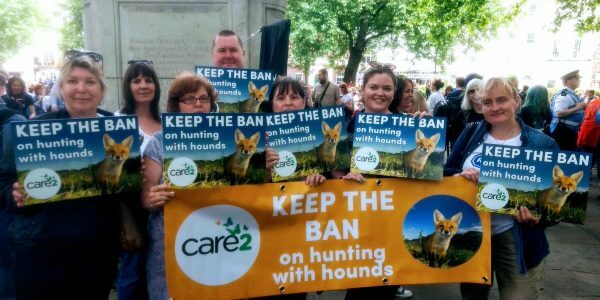 I spoke to a person at the demonstration who handles the emails for an election candidate and was told that our action was the biggest during the election period — they had received more emails from Care2 members about fox hunting, than from any other campaign on any issue. Well done to everybody who has signed the petition to email their candidates. Let us know how they’ve responded by tweeting @Care2! Hunting is unneeded in today’s society. With the wildlife dwindling as their habitat gets destroyed; let’s preserve the ecosystem still left.